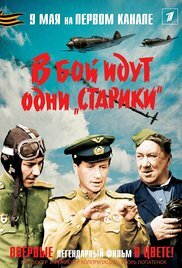 The film combines two storylines: the main war drama plot is paralled with vivid artistic performance - the fighter squadron doubles as an amateur musical group during rest time, led by its enthusiastic commander turned conductor. The title comes from two scenes in the film, where the squadron is facing very hard dogfights with German fighter planes, so only "old men" are sent up, while those fresh from flying school have to wait on the ground together with the mechanics. Soon, of course, the newcomers have replaced most of those veterans and have become "old men" themselves, taking to the skies while a new group of newcomers wait on the ground with the mechanics. Read more on Wikipedia.